Powered by Altera Stratix V FPGA, the HTG-S500 half-size PCI Express platform is ideal for applications requiring high bandwidth and low latency data processing between host servers and network interfaces used in data centers (i.e financial data processing). Supported by 40Gig Ethernet, PCI Express Gen3, DDR3, and QDR-II reference designs along with PCI Express Linux/Windows drivers, the HTG-S500 minimizes engineering efforts for complex design integration and verification. Availability of the HTG-S500 platform with different density of Stratix V FPGAs with the same device footprint allows easy design upgrade for different end applications. 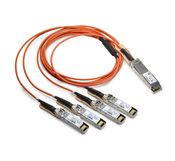 Four-Channel, Pluggable, Parallel, Fiber-Optic QSFP+ Active Optical Cable (AOC) to 4x SFP+ Active Optical Cable break-out solution. This cable is intended for 40G to 4x 10G applications. The AFBR-7IERxxZ is a high performance cable for short-range multi-lane data communication and interconnect applications. It integrates four data lanes in each direction with 40 Gbps aggregate bandwidth. Each lane can operate at 10.3125 Gbps. These cables also support 4x10G InfiniBand QDR applications and are backward compatible to the 4x5G IB DDR and 4x2.5G IB single IB SDR applications.